Robb Stark looks over the dead bodies of Tywin Lannister’s nephews. © HBO. 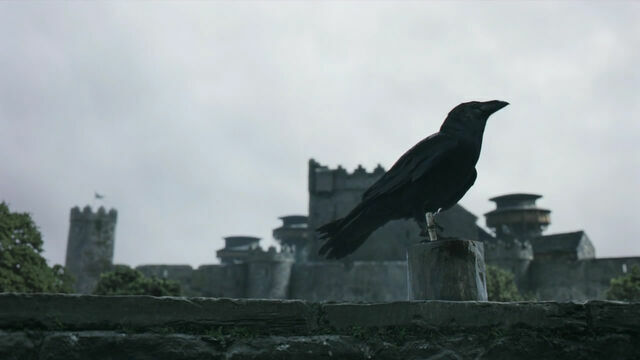 When the vengeful Lord Rickard Karstark murders Robb Stark’s hostages (Tywin’s nephews Willem and Martyn Lannister) in their beds, once again we see the motif of the murdered Princes in the Tower – even though the hostages are the sons of lords and not kings. Although the Lannister nephews aren’t particularly memorable, their murders are important. They unleash a chain of events that ultimately leads to the Red Wedding. “Young Princes Murdered in the Tower” by James Northcote (1786). Although nobody knows if the Princes in the Tower were murdered, traditionally Edward IV’s male heirs have been depicted as having been smothered in their beds. There are theories that they escaped or died of natural causes, such as osteomyelitis (a bone infection) of the jaw. Richard III’s somewhat contemporaneous historian, Sir Thomas More, wrote that two agents of the knight Sir James Tyrell, a Richard III adherent, smothered the princes to death in their beds. Then men then buried their remains “at the stair foot, metely deep in the ground under a great heap of stones,” but later disinterred and buried their bones in a secret place. Robb and his men capture the teenage squires Willem and Martyn Lannister at the battle of Whispering Wood. (In A Storm of Swords, they capture Willem Lannister and Tion Frey.) Robb is holding the boys hostage in the dungeon at Riverrun in the hope of exchanging them for his sisters. The boys wake up to hear a fracas outside their cell. Seeking vengeance after Jaime killed Karstark sons on the battlefield, Rickard Karstark and his men barge into their room. Pitifully, Willem asks if the men are rescuing them. One of the Karstark men then stabs him. Martyn begs for his life, stating he is a mere squire who has done nothing. Rickard Karstark responds by stabbing him in the belly. Furious over Karstark’s actions, Robb sentences him and his men to die. Executing Rickard Karstark, alienates the Karstark retainers, who abandon Robb’s army, which greatly reduces its size. As a result, Robb is forced to re-negotiate with Walder Frey for military support, which results in a marriage pact between his uncle Edmure and the Freys. This, in turn, leads to the fateful Red Wedding. Rickard Karstark, as portrayed by John Stahl. © HBO. While the Lannister nephews aren’t smothered in their beds, they are murdered in their beds and the imagery in the scene really drives home the parallels. We see two sleeping blond boys awakened by commotion. We see the men barge into a room (cell) with stone walls. And, we see the brothers plead for their lives. Arguably, the novels don’t draw as much of a parallel with the Princes in the Tower as the TV show— the boys aren’t even brothers in the novels. Likewise, in A Storm of Swords, the murder of the Frey and Lannister boys aren’t shown. (We only learn about them after-the-fact when the point-of-view character Catelyn Stark reacts in horror to seeing their bloody naked bodies.) As a result, it is unclear to me if George RR Martin necessarily intended for this scene to parallel the princes, or if the showrunners — deliberately or unwittingly — drive home the similarity. I can’t help but think it is deliberate at some level since murdering two adolescent boys in a cell does, after all, reinforce the Princes in the Tower theme.